You have added Rosalee Strapless Midi Dress in Orange Coral into shopping cart. FINAL SALE. 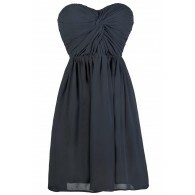 We love this classic strapless dress with a twist! The Rosalee Strapless Midi Dress has two slits on the front of the dress which add a fun twist. The dress is fully lined to the mid-thigh. 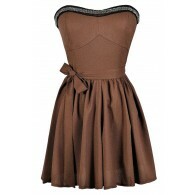 It has an empire waist, A-line cut, sweetheart neckline and two front skirt slits. The dress has strips of fabric sewn on the bust to create a unique look. Side panel ruching in the back expands to fit. A hidden back zipper completes the dress. This is perfect for a casual date night or summer concert. It can be dressed up with pumps and bold jewelry. It can also be dressed down with beaded sandals and a beaded headband. Details: Lined to the mid-thigh. Hidden zipper. 52% polyester, 48% viscose. Lining: 100% polyester. Hand wash cold. Do not bleach. Do not iron. Small measurements: Length from top of bust to hemline: 32”. Bust: 32”. You have added Rosalee Strapless Midi Dress in Orange Coral into Wishlist. You have added Rosalee Strapless Midi Dress in Orange Coral for Stock Notification. 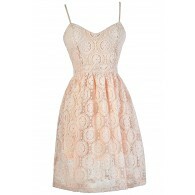 You have set Rosalee Strapless Midi Dress in Orange Coral as a loved product. 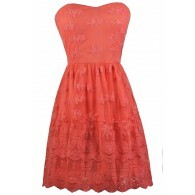 You have removed Rosalee Strapless Midi Dress in Orange Coral as a loved product.